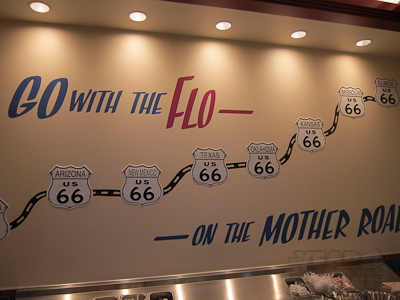 Flo’s V8 Cafe, or I Should Have Had a V8! Finally, the blockout period ends and I make my triumphant return to the Mouseland. I’ll admit I was feeling a bit of withdrawal. We (Kevin, Theo, and I) headed to CA Adventure for the night. 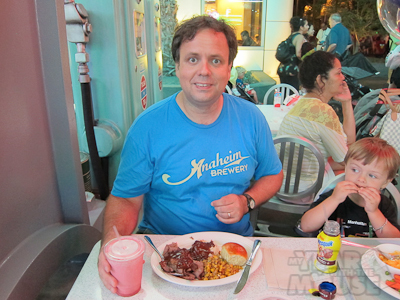 Kevin and Theo had obviously never seen Cars Land or Buena Vista Street–the sad consequences of being the spouse and child of the blogger rather than paying for the pass the blogger has. Theo, of course, spent a number of hours talking about how he wanted to see the castle and the fireworks. Theo was a bit nonplussed about Cars Land, but Kevin was impressed. 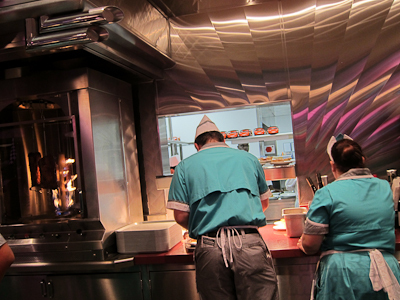 We decided to catch some dinner at Flo’s V8 Cafe. I’ll admit I was nervous. Disneyland has really made a huge effort lately to improve their food–diversifying menus and giving greater value for the money. But my brain is still partially stuck in that place where they served nothing but dry overprocessed burgers at exorbitant prices (not counting the churros and corn dogs). So I’ll totally cop to the fact that Flo’s made me nervous. They hand you a menu outside so you don’t spend your time at the register trying to read the menu board and holding everyone else up. I will warn you, the price on the printed menu is not the same at the register. Which is kind of lame. Their kids meal, you can get a roast beef sandwich, a turkey sandwich, or macaroni and cheese. 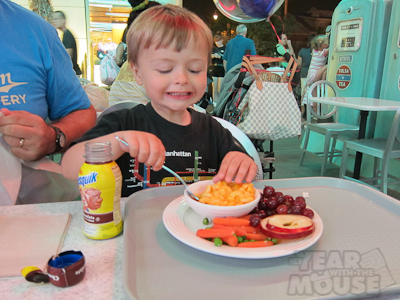 Theo picked the mac and cheese–a bit surprising since he generally doesn’t like mac and cheese (I know, right? What kid doesn’t love mac and cheese?). 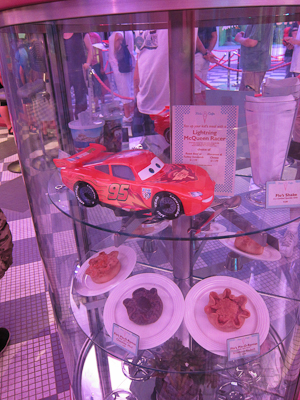 You could also get a Lightning McQueen racer with your kid’s meal. To be honest, I’m not entirely sure what it does. The wheels don’t move and it’s got two handles, so I guess it’s some kind of box or something? Anyway, it cost $6 more and we have a remote control Lightning McQueen at home, so we passed on that valuable opportunity. 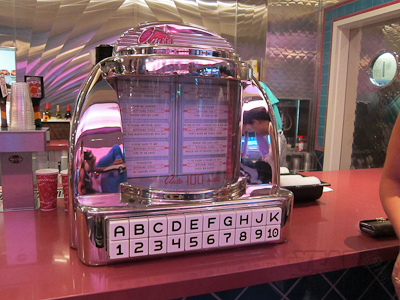 Up at the counter, the V8 Cafe does its best to be very 50s. Actually that picture kind of freaks me out a little. 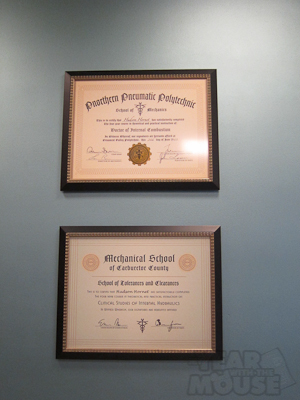 Also, on the left? Flames!!! The interior has plenty of seating. Actually more than you might think. And by you, I mean me. And by think, I mean assume. Even MORE interior seating! Can’t beat that with a stick! The silverware and condiment section was festive as well. 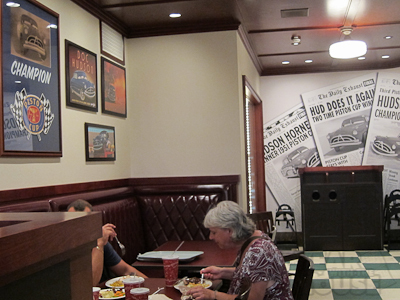 Also, Doc Hudson was a big-wig here, since he’s got all of these diplomas on the wall and stuff. Now Doc Hudson is voiced by the late Paul Newman in Cars 1 (also known as “Cars”). Which is totally awesome and all, except that he died before Cars 2 was recorded, so he (Doc Hudson) becomes this kind of posthumous character, without ever really explaining how a car ages or what it means to die. I mean, does a car go all Thelma and Louise and throw itself off a cliff? And how old are the cars in Cars anyway? I ordered the pork loin dinner. I was very hesitant (can you tell I’ve been burned by Disneyland food before? And not in a temperature kind of way), because badly-done pork is REALLY bad. Like it’s all dry and chewy and you’re totally screwed once you go past that tipping point of nice and juicy and just plain overcooked. 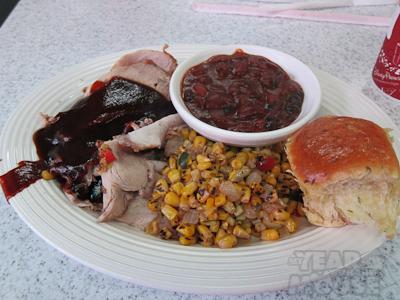 However, at Flo’s, the pork came with a Coke BBQ sauce. Coca-Cola, not the drug. And that kind of appealed to me. It came with two sides, so I got the corn medley and the baked beans. It also came with a roll I found a bit uninspiring. But overall, my pork was actually excellent! It was nice and moist and non-chewy. The BBQ sauce added the right amount of tang with just a bit of spiciness. I would totally get it again. Kevin, in this slightly dazed picture, got the beef strip plate with gravy. It too was also very good. Go figure. He couldn’t resist a strawberry milkshake, but got it in a regular cup rather than the collectible Flo’s glass, which we really don’t need. The milkshake also came with “road gravel” which was basically little malt balls that just kept getting stuck in the straw. Cute, but not practical. Theo got, as I mentioned, the mac and cheese (sans Lightning McQueen racer car thing). It came with grapes, apple rounds, carrots, and peas. I actually really like that they put all the healthy food out there and if you wanted something else you had to ask. All in all, I was very impressed! 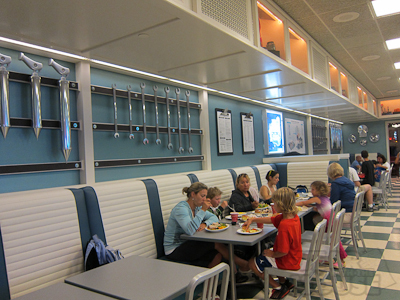 The food quality was great and the prices were on par with the rest of the park. Plus the outdoor seating area was ideally located for people and car watching.